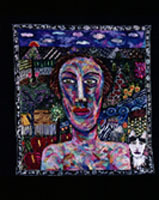 While historically one of the most popular themes in art, the figure appeared infrequently in the Fiber Art movement. The monumental fiber art forms of the 60s and 70s began a precedent for abstraction in order to place the work within the "serious" art discourses of modernism and later, postmodernism. 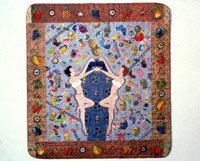 Referencing the figure, especially in embroidery, risked placing the work outside of a contemporary fine art context. 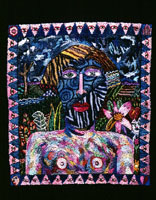 Thankfully, in the later part of the 20th century, Fiber artists began to ignore these arbitrary critical conventions and develop more figurative work. Today the figure has become the starting point for understanding/interrogating their work. The soft surface of cloth, a tactile and familiar medium, enhances the process. 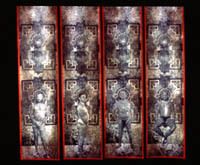 The artists shown below demonstrate how the figure can deconstruct religion, express humor or define culture. 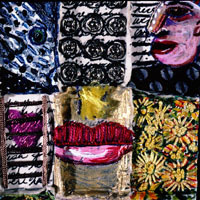 Mary Bero is an expert at creating expression with thread. 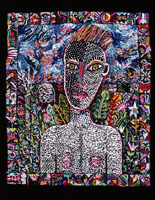 Her pieces, while small only in size, are intense and confrontational in their non-traditional use of embroidery. Humor is the overriding theme in Wendy Huhn's work. Combined with a certain nostalgic domesticity, however, her work encourages us to question the strange juxtapositions of her images  what is Huhn really saying when viewed through current cultural values? Alice Kettle brilliantly uses size to convey her "purely personal comment on the human condition". Kettle's figures, which are the "essence of her work", seem to float almost spiritually in her large, lyrical and painterly canvases. There is no subtlety in the three-dimensional, iconographic figures of Austrian artist Sara Lechner! Her work transcends her South American heritage by challenging blind obedience to both religious and patriarchal authority. Ed Lambert is obsessed with Pop culture's obsessions--wrestling, tattoos, the tabloids. Cloning his own printed figures, he searches the world outside his isolated academic life for clues and understanding. "Print it once, you see it; print it twice and you know it and print a third time and it becomes part of you." 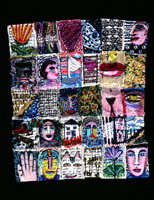 This is but a sampling of the diversity and power of today's figurative work within the Fiber Art field. The figure as a point of departure in fine art will continue to evolve. 6.375" x 4.125" x .5"
vintage apron, embellished, machine quilted. vintage fabrics, doll hair, netting, couching. Four panels, 132" x 19" x 5"; 117" x 38" x 2"; 119" x 24" x 8"; 129" x 12" x 5"
Three panels each 109" x 63"